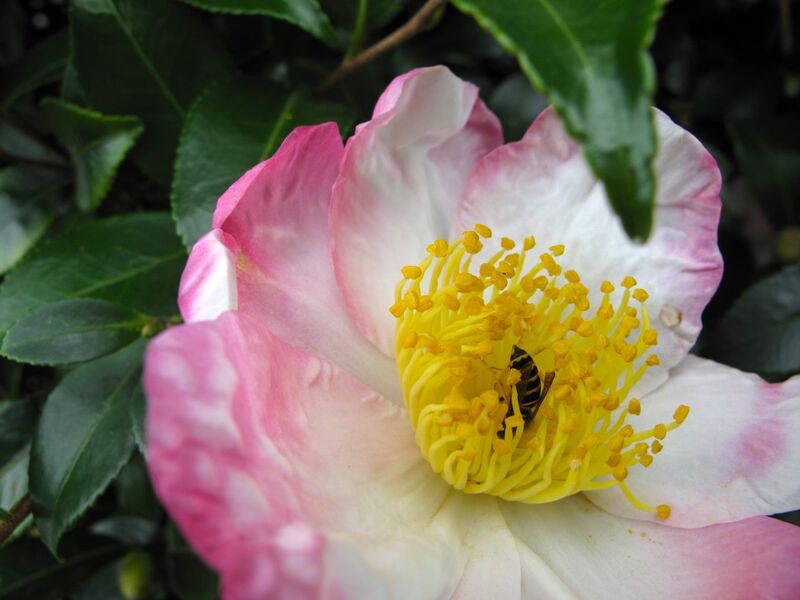 This entry was posted in garden and tagged Camellia sasanqua on October 16, 2013 by pbmgarden. I can only imagine the scent, but the flowers are very pretty. They have a delicateness about them that is dear. Have a good day. So pretty at this time of year and the bee is enjoying it too! Hi Pauline. Pink might seem odd in autumn but the camellia is located where nothing else is blooming. Makes its location very cheerful. Perhaps you’ll find the perfect little (or big–some can grow quite large) spot for one Annette. I’m thinking about adding another (white this time). Guess it has to be a bit protected too. My garden is quite large so no doubt I’ll find a place. Thanks for stopping by Michael. I’ll check out your fall flowers. What beautiful flowers, they remind me of single peonies. And I like the shiny foliage. Lovely, you are so lucky to be able to grow these! I need to add some more camellias–They reward so well with so little demand. I haven’t grown camellias since I was a teenager back in Sydney. Now half way around the world, they are trailing this species at a Zone 6A garden in Kansas City. Assuming in micro-climates, but wouldn’t it be grand to see some after over 20 years? Nice blog you have here. Thanks for visiting Patrick. Hope the trials prove successful so you can again enjoy camellias. 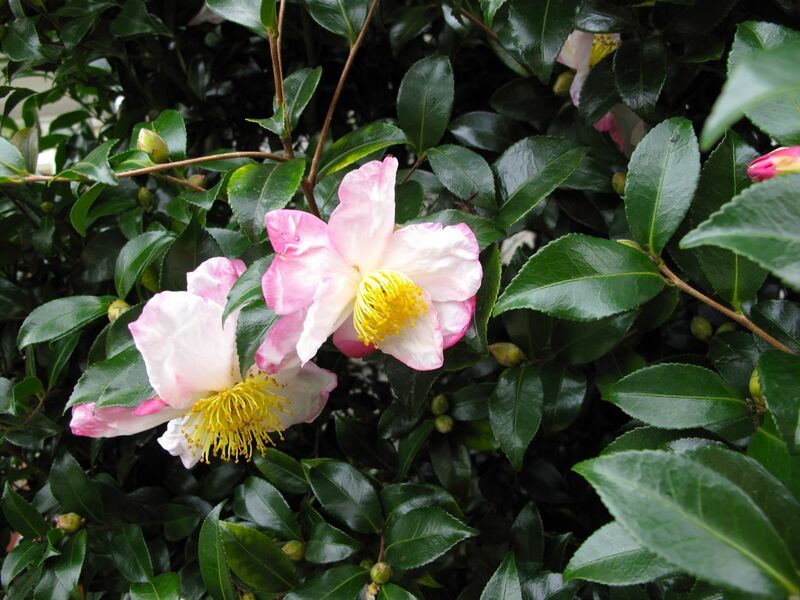 There is a well-repected camellia nursery nearby you might enjoy knowing about–Camellia Forest (http://www.camforest.com). I think your unknown Camellia may be ‘Hana Jiman’ given the size of the bloom and the coloring. Thanks so much for the identification. I will look that up. Ha! I just read your “about” page and realized that you live in my neck of the woods! I work at the best nursery in Raleigh so maybe we’ve even met before. What a small world. Incidentally I was looking for more information on Autumn Moon Camellia and just happened to be lead here. Nice to hear from you. I have visited a fine garden center in Raleigh occasionally. Please look around and vist my blog again.